Crushed Ice - Ice Cubes - Dry Ice - Yes, We Do Snow! Old Town Newhall Ice Company is the best source for ice in the Santa Clarita Valley and surrounding Los Angeles County area. Our crushed ice, cubed ice, block ice, cocktail ice, and dry ice is available in individual and bulk quantities, and can be picked up or delivered. We have provided IPIA certified packaged ice to local restaurants, bars, gas stations, convenience stores, liquor stores, construction sites, catering companies, movie sets, schools, and more for decades, and are known for providing high-quality ice products at a competitive price with exceptional customer service. In addition to meeting the packaged ice needs of residential and commercial clients from Castaic to Los Angeles, we’re also able to realize special occasion ice requests. Whether you are interested in a custom ice sculpture, an ice bar, or a snow play area, our crew can make it happen. Our ice sculptures and snow ice are ideal for community events, holiday parties, birthday parties, product launches, award ceremonies, tv/movie film sets, and any other event that you’d want to make unforgettable. 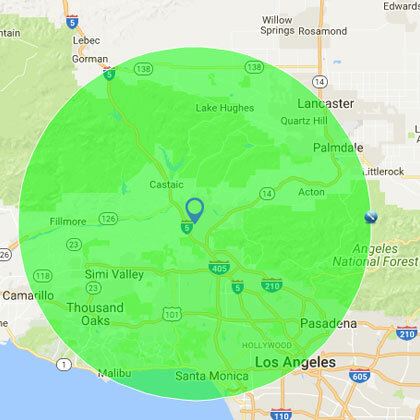 You can reach Old Town Newhall Ice Company 24 hours a day, 365 days a year to have ice delivered anywhere in Santa Clarita, Newhall, Castaic, Stevenson Ranch, the San Fernando Valley, and nearby cities in Los Angeles County. Our emergency ice delivery service is prompt, reliable, and affordable. Because we have drivers on call, well-maintained trucks, a large local inventory of bagged ice, dry ice, and block ice, and we’re able to have most urgent ice orders delivered within two hours. In addition, we can also rent commercial ice freezers on a short-term or long-term basis. Call today to place an order for bagged ice, dry ice, block ice, an ice sculpture, or snow ice. Our staff is highly experienced, friendly, and customer service focused. Additionally, we go above and beyond to make doing business with us as easy as possible. We can set up new accounts on the same day, help you figure out how much ice you’ll need for an event, and even carry your ice right out to your car when you come to our loading dock to pick up your order. Visit Old Town Newhall Ice Company at 22502 5th St., Newhall, California 91321, or call us at (661) 259-0893. We’re open 7 days a week, and always have a live person answer our phones. Ice delivery service is available throughout Santa Clarita, Newhall, Castaic, Stevenson Ranch, Forest Park, Humphreys, Sylmar, Val Verde, Granada Hills, Porter Ranch, the San Fernando Valley, and nearby cities in Los Angeles County, with a minimum ice of order of 300 pounds. For smaller quantities of ice, come by our shop located at 22502 5th St., Newhall, CA 91321. Thanks to Trey and Sara Hajek, our SCV Relay For Life 2017 walkers were able to stay cool and hydrated during the hottest weekend of the year so far. We ran out of ice, and they were quick to bring us additional ice. When we ran out AGAIN, after hours, they brought us more. Newhall Ice was a complete life saver. These two went above and beyond anyone's expectation. If you need anything Ice Related, Newhall Ice is the place to go!! Thank you Trey and Sara for being such a great asset to the Santa Clarita Community! !